How do you follow up a great debut album and avoid the sophomore jinx? Bring an equally strong sequel. That's exactly what Jacksonville's Artizan has done with Ancestral Energy. Once more the band successfully blends the best of classic melodic heavy metal with nuances of power and progressive metal. Artizan:: listen to Death of Me. Among many things, the singular strength of Artizan is their ability to weave the best aspects of those in an interesting and entertaining fashion. The title track, the longest song and featuring ex-Iced Earth singer Matt Barlow, is a perfect example. Lots of classic melodic heavy and power metal woven in different movements without the burden of technical excessiveness. Yet, that's what Artizan has always been after, creating good sounding heavy metal that both entertains and keeps your interest. Besides the epic title track, there's very catchy anthem I Am the Storm (which should have been the first single, sorry guys). Stricter heavy metal comes with You Can't Take the Metal, where drummer and principal lyricist Ty Tammeus confirms his commitment to his genre of choice. Another more traditional melodic metal song comes with The Guardian, sounding like the Eighties American response to NWOBHM. Possibly the most compelling song is Deep Oceans Deep, with Tom Braden's vocals and vocal arrangement at their most powerful and haunting. He's one the best pure melodic metal vocalist in this day. Once more, with Ancestral Energy, Artizan delivers a fine platter of classic melodic metal. It makes you wonder how they'll follow this one up in the future. Good stuff, and strongly recommended. 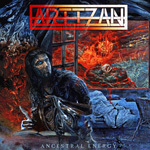 Once more, with Ancestral Energy, Artizan delivers a fine platter of classic melodic heavy metal with some prog nuances, propelled by strong arrangements and Tom Braden's powerful vocals. Easily recommended.